SRI LANKA (ACN News): The leader of Catholics in Sri Lanka has said the Church has a crucial role to play in helping to bring healing after the country’s bloody civil war. In an interview with Aid to the Church in Need, Cardinal Malcolm Ranjith of Colombo said that, although Catholics were only a minority on the island, they were in a unique position to help promote reconciliation between Sri Lanka’s two ethnic groups. “We must never say we are Sinhalese first and then Christian, we must say we are Christian first and then Sinhalese,” he said. “The same applies to the Tamils also. They must first be Christians, because as Christians we have certain principles that we have got to follow. By the time the Colombo-based government’s forces secured victory over the Liberation Tigers of Tamil Eelam (Tamil Tigers) in May 2009, up to 100,000 people had died in the 25-year civil war. Amid continued tension between the two ethnic groups, the cardinal described how religious initiatives could help unify Sri Lankans and gave the example of how both Sinhalese and Tamil pilgrims visit the shrine of Our Lady of Madhu. He said such activities can act “as a catalyst, as an example (that) people can live together in our faith”. “We have to be a witness, not so much through words but through actions – the way we live with one another,” he said. “So, since we are Christians, even though we may be Sinhalese and Tamils, it is essential that … we try to build fraternity as much as possible – and understanding – and then this is the way we would tell others (that) Christians have no problems with race and language. In a total population of 20 million, Christians in Sri Lanka are eight per cent and are spread across both Tamil and Sinhalese-dominated areas of the country. 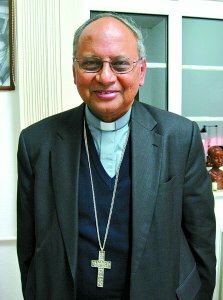 Cardinal Ranjith said that, before the war, seminary studies helped to break down the divide as students from both ethnic groups learnt together. “We had very good friendships across the border,” he said. But the cardinal said he regretted that Tamil and Sinhalese seminarians no longer trained together as much as before. “Unfortunately due to this war the northern diocese had to erect a new seminary for their own students, which was unfortunate because what is necessary is that we unite together,” he said. However, he said he has collaborated with Bishop Thomas Savundaranayagam of Jafna diocese, where the northern seminary is based, and is sending seminarians from the Archdiocese of Colombo to study philosophy there. “These students are Sinhalese, (but) they are in the north, they are studying Tamil. I want them to study both languages (so that they are fluent in both of them),” Cardinal Ranjith said.